Forty Hall & Estate is changing and full refurbishment is underway for this magnificent Jacobean mansion with formal gardens, parkland and ornamental lakes. 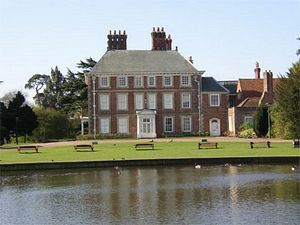 The Forty Hall development project, funded by Enfield Council and the Heritage Lottery Fund, will transform the Hall to its former glory, reopening in spring next year, ahead of London 2012. Whilst builders are in the Hall our wide outreach programme continues across Enfield. We offer a programme all about the arts, heritage and ecology using events, creative workshops, performances, festivals, exhibitions, creative and heritage opportunities, art commissions and site specific artworks, tours and walks, hard hat tours, and opportunities for schools and colleges. There really is something for everyone! We positively welcome volunteers and student placements. ALL Londoners and visitors to London should explore this 'Jewel in London's Crown' and all that we have to offer. NB: Forty Hall Banqueting Suite will remain open during the refurbishment for all your party, conference and special event needs. The historic parkland will remain open throughout the year so you can watch the changes to Forty Hall. For more information, visit the Forty Hall website (link above). Forty Hall is located in the north of the London Borough of Enfield, the northern-most borough of London. The hall and formal park are located on the top of Forty Hill, a level gravel plateau standing above the flood plain of the Lea to the east, and the valley of the Turkey Brook to the north and west. The park slopes down into the valley, where the remains of old ponds lie on the London Clay. A loop in the former course of the New River forms the boundary of much of the estate, though this has since been re-routed to the east. To the north are Whitewebbs and Myddelton House. The road to the east was formerly the main route from Enfield to Waltham Cross, but traffic has been re-routed towards to A10.